REM sleep may be the most fascinating and well-studied phase of sleep. Non-REM refers to the minimal eye movements of the first three stages of sleep, while REM refers to the rapid eye movements characteristic of the fourth and final stage of sleep. Our understanding of sleep and dreams took a significant step forward with the discovery of rapid eye movement sleep in 1951. Researchers discovered that not only do the eyes move during REM sleep, but the brain is nearly as active as it is while awake. Marked shifts occur in the brain and body during REM, heralding a stage entirely unlike the other three stages of sleep. 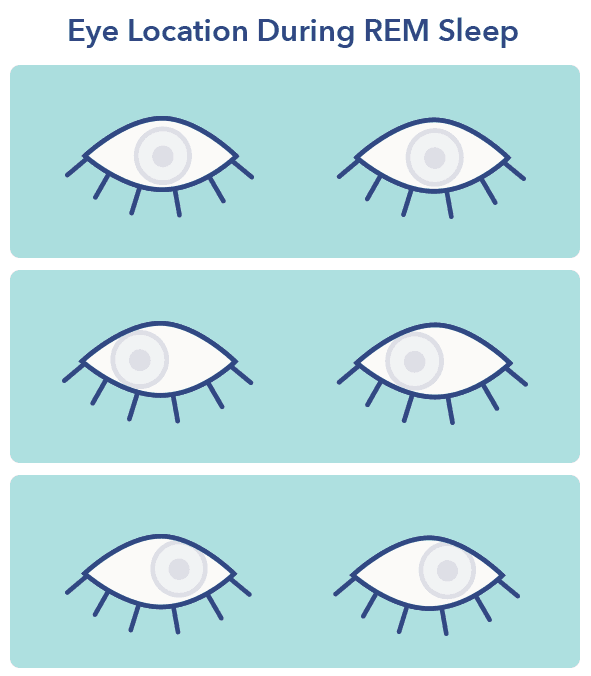 Each of the four cycles of sleep consists of four stages: three non-rapid eye movement stages referred to as N1, N2, and N3, and a rapid eye movement stage referred to as REM. Non-REM sleep dominates during the first half of the night, while REM stages get longer toward morning. REM sleep occurs at the end of each cycle and is the lightest stage of sleep besides N1. The first REM stage begins approximately ninety minutes after the start of the sleep period. Because non-REM stages are longer at this time of night, the first REM period may last less than ten minutes. Approximately 20-25% of total sleep time is spent in REM sleep. The eyes move in tandem during REM sleep. Though the eye movements are rapid in comparison to the non-REM stages of sleep, they are generally less rapid than during wakefulness. One study concluded that each eye movement of REM may indicate a “scene change” in a dream, similar to the way eyes move and see different things when the brain is awake. The rapid, jerky motion of the eyes that occurs during REM sleep. During REM sleep, heart rate and blood pressure approach waking levels. These fluctuations in bodily function are unique to REM, and do not occur at any other time during sleep or wakefulness. Though sleep stages usually proceed in order, they vary in terms of length as cycles repeat throughout the night. In addition, the amount of time spent in each stage may be dependent on when a person falls asleep. Early risers tend to spend more time in NREM sleep, which is dominant between 11 pm and 3 am. Night owls spend more time in REM sleep, which is more prevalent between 3 am and 7 am. Q: Is there a term for people who are in between early birds and night owls? A: Yes. People whose natural circadian rhythm falls somewhere in the middle are called intermediates. The amount of time spent in REM sleep tends to decrease with age. (5) Sleep fragmentation also increases with age, though this may be due at least in part to medications used in the elderly to treat medical and psychiatric conditions. Another term for REM sleep. “Paradoxical sleep” refers to the physiological similarities between REM and the wake state. Dreams are most common and vivid during REM sleep. They occur on occasion during Non-REM sleep, but are strongly associated with REM and the physiological changes that occur during this stage. The brain activity and muscle paralysis of REM sleep set the stage for dreaming and prevent the acting out of dreams, which appear to help in the processing of emotion and memory. As REM sleep begins, the brain generates PGO waves, or Ponto-geniculo-occipital waves. These waves move from the brain stem to areas responsible for processing visual signals and information. 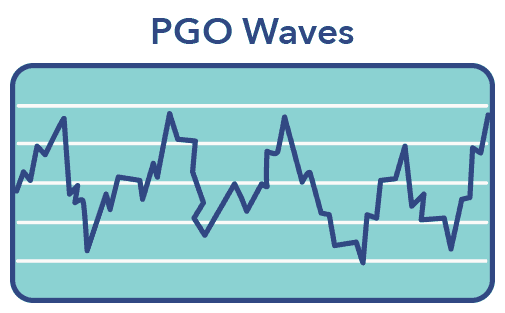 PGO waves appear to be closely connected to the eye movements of REM sleep as well as the visual phenomena experienced during dreams. Studies show that denser groups of PGO waves correlate to more vivid dreams, supporting the theory that PGO waves are associated with the visual element of dreams. (6) We may be able to “see” our dreams due to the involvement of PGO waves with parts of the brain associated with visual processing. Some researchers theorize that PGO waves may also cue the brain to play back the day’s experiences and emotions during REM so they can be processed and stored as memories. 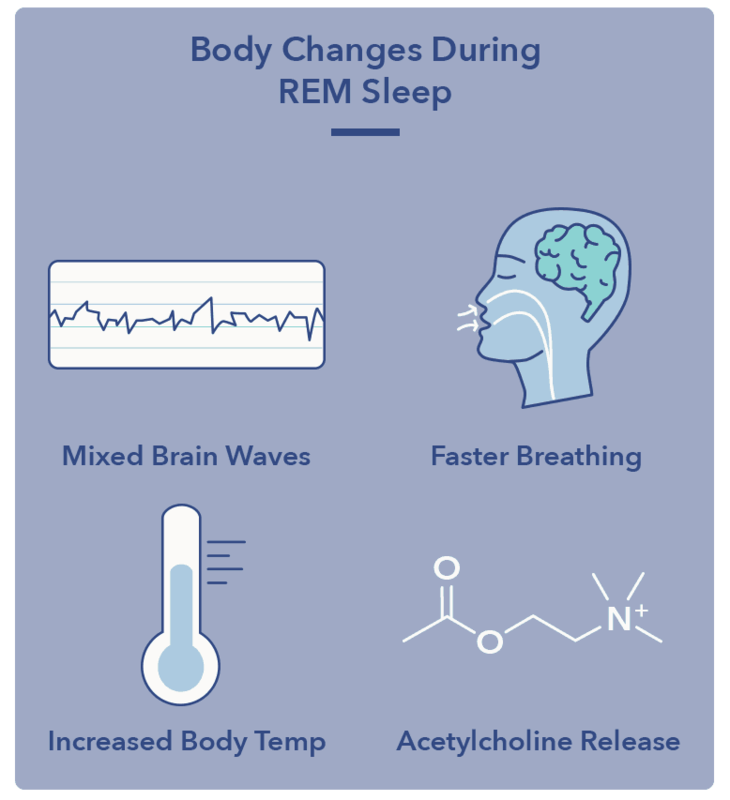 Stress hormones are conspicuously absent during REM sleep, which some sleep scientists believe may help decrease negative emotions associated with certain experiences as the brain converts them to memories. Q: What are brain waves? A: Brain waves are synchronized pulses from large numbers of neurons, detectable on electroencephalogram as peaks and valleys. Sleep paralysis usually results from incomplete awakening during REM sleep. 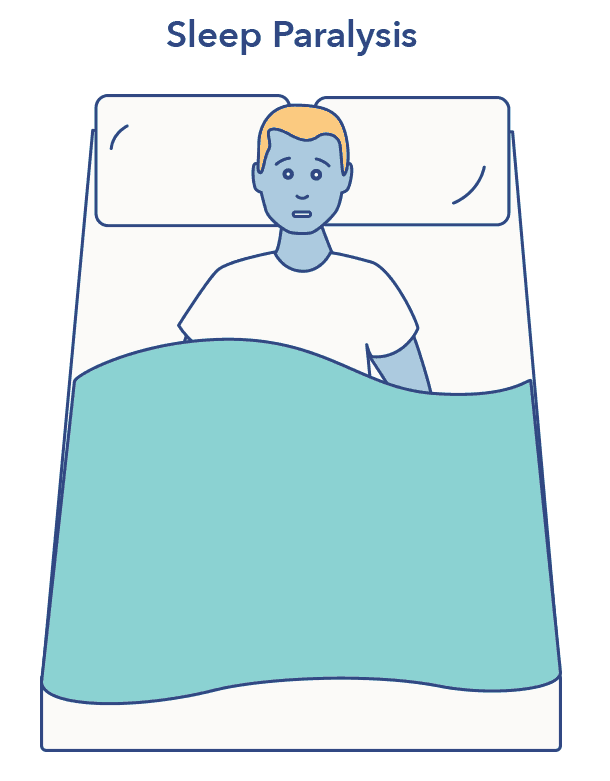 This form of parasomnia can cause the inability to move or speak while the brain is awake and conscious. Sufferers usually describe sleep paralysis as a frightening phenomenon, though the effects are temporary and typically last only a few seconds. Rare episodes may last for minutes or even longer. REM sleep is the predominant stage of sleep in infancy, and gradually diminishes with age. (10) REM sleep decreases approximately 0.6% in each decade of life. As much as 50% of a baby’s sleep time may be spent in REM, with the rest spent in the deep, restorative stage of N3 sleep. The muscle paralysis of REM-atonia is not fully developed in infants, allowing them to move and twitch during REM sleep. Because infants don’t have the motor skills or physical ability to act out dreams, the muscle paralysis of REM-atonia is not crucial at this age. REM-atonia is usually fully developed by age one. Many adolescents do not get the recommended 8-10 hours of sleep each night, and do not spend sufficient time in REM sleep. This type of chronic sleep loss may lead to lower cognitive function, irritability, depression, and daytime sleepiness. Adults spend approximately 20% of sleep time in REM sleep. During this phase of life, other stages of sleep dominate the sleep cycle, particularly the lighter stage of N2. REM sleep gradually decreases throughout adulthood and is replaced by other forms of sleep, as well as time spent awake during the night and while waiting to fall asleep. Though sleep needs remain the same, REM sleep continues to decline into older age, plateauing by around age seventy-five. There appears to be a slight uptick in REM sleep in people in their early eighties, an increase not explained by current research. The age-related decline in REM may be associated with a drop in certain sleep-related hormones such as growth hormone and cortisol. (12) These hormones may also be associated with a similar decrease in slow-wave N3 sleep. Cessation of breathing. Apnea comes from the Greek word apnous, meaning breathless. Some age-related changes to REM sleep may be mitigated by a regular exercise regimen, consistent sleep and wake times, and stress reduction techniques such as meditation and guided imagery. Early treatment of sleep disorders and other medical conditions may help regulate sleep and preserve the REM stage for as long as possible in old age. REM sleep is the last stage of the sleep cycle, a time when the sleeping brain is nearly is active as the awake brain. The dreams of REM sleep appear to allow for emotion and memory processing in an environment free of stress hormones. REM sleep may help explain why we often remember more positive than negative experiences, and are able to file away certain difficult events without damaging effects. Each of the four stages of sleep complements the other, and has its own crucial function. Together, the four stages make up the complex architecture of sleep, one of the pillars of health and an essential part of well-being.